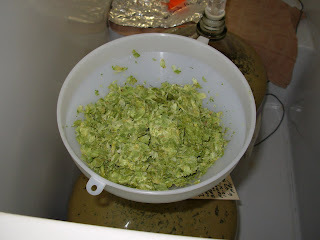 Stuffing the hops into a funnel and into the carboy. This took quite some time since I was using a rubber spatula. the handle was flat instead of round so not a lot of hops got in with each push. 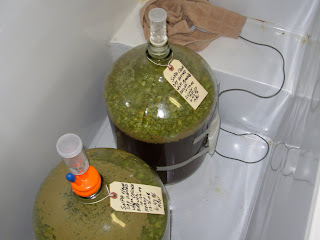 Two carboys filled with hops. A close up of the carboy w/the Amarillo. 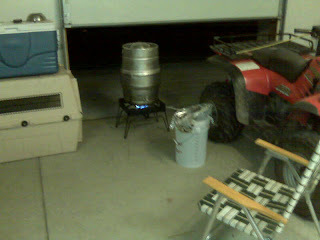 Today I brewed up 10 gallons of Pale Ale. Since it's a work day I decided to try to start brewing early, I mean really, really early. I lit the burner at 4:11 AM and mashed in at 5:19 AM. This is by far the best time of day to brew! Lighting the burner at 4 AM! Coffee and hops. The breakfast of champions! 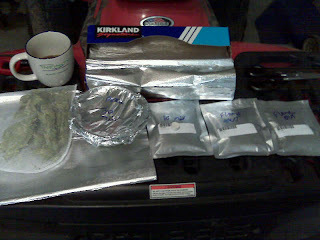 I've updated my process for creating starters thanks to advice from my brew buddy Mark. Now I start with 4 cups of water, a pinch of yeast nutrient and 1.5 cups of light malt extract. After this sits on the stir plate with the yeast (two vials of White Labs) for a couple of days I repeat the recipe and add it to the flask. I had great success with the fermentation of the Scotch Ale (due to hit my fridge in about a week) and I had even greater success last night. For the first time ever I have krausen in my starter, a sign that I've hit the perfect gravity on my starters! The pic below was taken this morning after the second feeding of the starter last night. 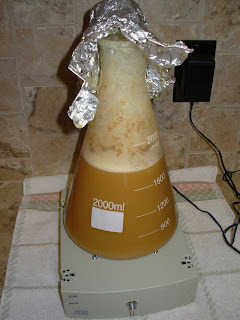 The krausen came all the way up to the top of the flask and even puked out a few yeasties onto my stir plate. 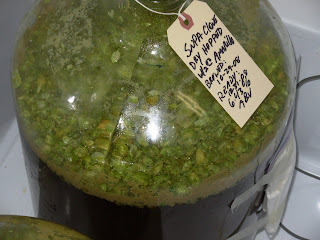 This should make for some very active fermentation when I pitch this yeast into my Sierra Nevada Pale Ale clone tomorrow!